← Derick Brassard expected to skate with team tomorrow; Should the Rangers give Oscar Lindberg a shot? Rangers center Derick Brassard’s five day isolation period is over, and rejoined the Rangers practice on Friday. Brassard is expected to play against the Hurricanes on Saturday. Photo courtesy of MSG Photos. After missing the past two games with the mumps, Derick Brassard rejoined the Rangers for Friday’s practice. Following the morning skate, Rangers head couch Alain Vigneault announced that he expects him to play Saturday’s game in Carolina. Brassard, who centered Rick Nash and Mats Zuccarello during practice, said that he would wait until the morning before he decided if he was ready to go against the Hurricanes, after having some difficulties building up his strength and conditioning once again. Brassard’s return to the ice was met with applause from his fellow teammates, and goalie Henrik Lundqvist commented on his return. 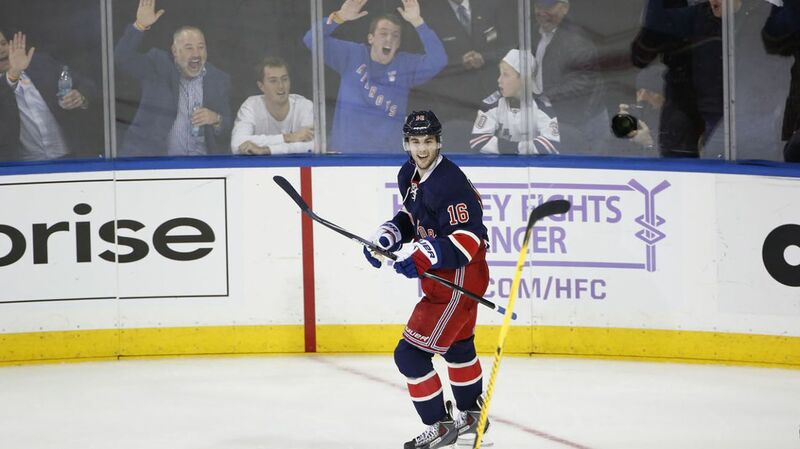 Brassard has taken over the team’s number one center role, and is second on the Rangers in scoring, already picking up 24 points (8-16-24) in just 27 games this year. Brassard and Nash have also built up chemistry since playing together. JT Miller has taken Lee Stempniak’s spot on the third line following the news of his five day isolation from the team. Since being recalled from Hartford, Miller has played left wing, center, and now right wing, and has done an excellent job filling in for whatever role is needed. Alain Vigneault also announced that Henrik Lundqvist would get the nod for tomorrow’s game against the Hurricanes in Carolina, but did not say what he would do for Sunday’s game at home. Henrik Lundqvist will start in net on Saturday against the Hurricanes. 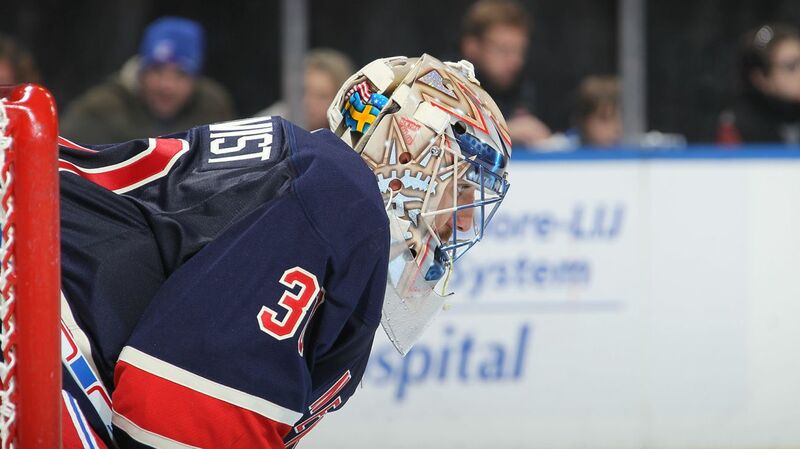 It will be Lundqvist’s fifth consecutive stat, and he has won his previous four. Photo courtesy of MSG Photos. “Our focus is on Saturday,” said Vigneault. Which is exactly what you want to hear from your head coach. In other news, New York Rangers General Manager Glen Sather announced that goaltender Cam Talbot has signed a contract extension with the Blueshirts. The details were not announced, but Talbot’s contract expired following this season, so he is locked up for at least the 2015-2016 season. Talbot, who is 27, has made seven appearances, six of them being starts, and has a 2-3-1 record alongside a 2.34 GAA and a 9.21 save percentage. He also has two shutouts this season, with both coming against the Flyers on November 19th and November 28th. He also has the fourth longest shutout streak in the NHL this season, which was ended at 159:48. The Rangers announced that they have signed Cam Talbot to a contract extension. The terms of the deal were not disclosed. Photo courtesy of MSG Photos. In 28 career appearances, all with the Rangers, Talbot has a 14-9-2 record, a 1.80 GAA, and a .936 save percentage, as well as five shutouts. 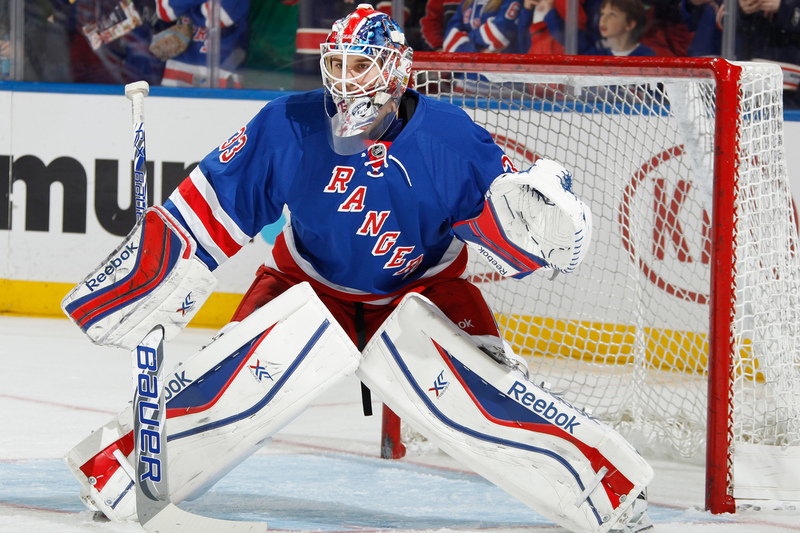 He is only one of two goalies in Rangers history to have at least five shutouts in his first 24 NHL starts. This is a very smart move by Sather. Talbot has shown signs of a skillset that belongs to a starting goalie in the NHL, and was extremely valuable last season when Henrik Lundqvist was struggling to find his game. Talbot is one of the better backup goalies in the league, and I’m sure all fans will be happy to have “The Goalbuster” on the team for another season. Posted on December 20, 2014, in Rangers Updates and tagged Alain Vigneault, Anthony Duclair, Cam Talbot, Carl Hagelin, Carolina Hurricanes, Chris Kreider, Dan Boyle, Dan Girardi, Derek Stepan, Derick Brassard, Dominic Moore, Edmonton Oilers, Eric Staal, Henrik Lundqvist, Jesper Fast, John Moore, Jordan Staal, JT Miller, Kevin Hayes, Kevin Klein, King Henrik, Lee Stempniak, Madison Square Garden, Marc Staal, Martin St. Louis, Mats Zuccarello, Matt Hunwick, MSG, Mumps, New York Rangers, NHL, NHL 2014-2015 Season, NHL Mumps, NY Rangers, NYR, Oscar Lindberg, Rangers Nation, Rangerstown, Rick Nash, Ryan McDonagh, The Duke, The Ranger Zone, Vancouver Canucks. Bookmark the permalink. Leave a comment.